Derry City assistant manager, Kevin Deery, pictured with manager, Declan Devine reckons the new management team at Derry City can breathe new life into the club. KEVIN DEERY is confident Derry City’s passionate, all-local management team can inject new life into the club and bring enjoyment back to the Brandywell Stadium. The former Derry City captain has returned to the club as assistant manager to Declan Devine after an absence of five years, having cut his teeth in management with Trojans, Institute and Sligo Rovers. And since being released by then Derry boss, Roddy Collins in 2014, after 12 successful years and 302 competitive appearances, the passionate Creggan man made it his sole purpose to return to his hometown club, claiming he has ‘unfinished business’ to attend to as the club begins a new chapter. As Devine’s right hand man, Deery believes the new management team can help change the mentality at the club and bring the fight and passion which was in such short supply for much of last season’s disappointing campaign. There’s no questioning his enthusiasm for the job at hand and Deery regards himself as fortunate for getting the opportunity to have a positive impact on Derry City Football Club. “I was fortunate to spend my whole playing career at Derry,” said Deery. “I’ve been away for five years trying to find my path in coaching and it was always an ambition to come back and try and fulfil my potential and I’ll give everything to do that at Derry City. The club’s Board of Directors have made the decision to appoint an all-Derry management team who have all represented the club with distinction. It has given a gentle lift to Derry fans mourning a disappointing season and the decimation of much of last season’s squad. With just a handful of players under contract for the 2019 campaign it’s a considerable task facing Devine and his team but Deery is confident they can assemble a competitive squad which the club’s supporters will be able to identify with. “It’s about passion and pride and the supporters being proud of their team and that’s what we’re looking at as a success story - real pride and passion from our team and enjoyment for our fans who can walk out of the Brandywell and know our team is showing the fight and spirit that we want to see again. “Myself and Declan both have the mentality that Derry should be fighting and showing spirit and he’s learned a lot since the last time he was here. We’re all ready for the challenge, myself, Declan, Marty (McCann) and Paddy (McCourt) who are two great coaches. “We would do absolutely anything for our players,” he insisted. “Even when I was captain I would’ve policed the changing room. You have to enjoy this game. It’s a game we all love. There’s no point thinking it’s a chore or a penance. Deery has had a long standing working relationship with Derry City boss, Devine since their days playing youth football for Creggan club, Ashfield Youth which trained at the old St Peter’s High School. While former Holy Child pupil, Devine is 12 years Deery’s senior their football paths have crossed quite a bit since those days. Deery, of course captained Devine’s 2012 FAI Cup winning side and he’s delighted to work alongside him once again. “We’re Derry men at the end of the day. Both of us were born and reared in Creggan. There’s nothing else we know. I’ve been going to games in the Brandywell since I was 12 or 13, maybe even a bit younger. I always have gone and always had a fondness for the club. As Declan said, we want to try and get this club back to where we feel it belongs. “We both left Derry at the same time. Roddy Collins decided it was my time to go and it seems, for me, to be a bit of unfinished business now. The both of us are very enthusiastic about this job. We know there is a hell of a lot of work to do and we’re totally committed to doing that mountain of work and beyond. “We’ve got a clean slate and want to come in and focus on the task at hand. At the minute we have to rebuild the first team. We were down having a look at the U19s and U17s too because we’re firm believers in that as well. “This time Declan will leave no stone unturned. We’re coming in and we feel we’re the right fit for the club at the right time. We’re going to work extremely hard to make everyone happy and proud. That’s what we’re judging our success on this year. We want to inject a bit of life into the Brandywell again and inject a bit of life into everyone at the club. The last time Deery was in the Brandywell dugout was as Sligo Rovers assistant boss last August as the Bit O’Red dominated their hosts and clinched a thoroughly deserved 2-1 win. Deery says he took no pride in that result but is desperate to ensure Derry City aren’t so easily beaten on their own patch again. “Geographically we’re at a disadvantage, lets be honest. You see one player move from one Dublin club to another or maybe down a bit to Waterford. Geographically we’re a bit challenged but that’s always been the case. “We’re desperately trying to keep our identity. The club have done that by appointing an all local staff. 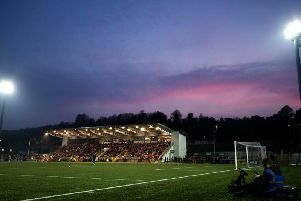 We’re not foolish thinking we can flood the team with Derry lads but we’re trying to get people to relocate to the city - it’s a lovely city to live in and it’ll reward you. “What I can guarantee is we’re concentrating on getting a team that reflects the graft and endeavour of the people of Derry - that’s what we’re trying to replicate on the playing side of things.